Airports and Airlines have so many contactmoments that they still not use. 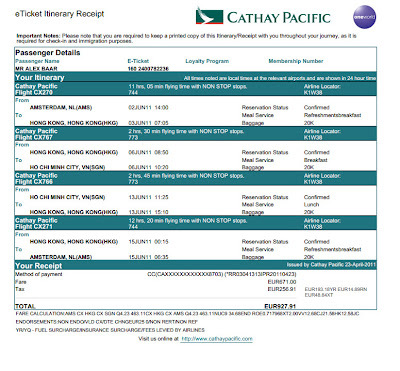 Booking confirmations is one example..It would be great to work on that, and to know that you please people with information and help the airline with additional customer information.. 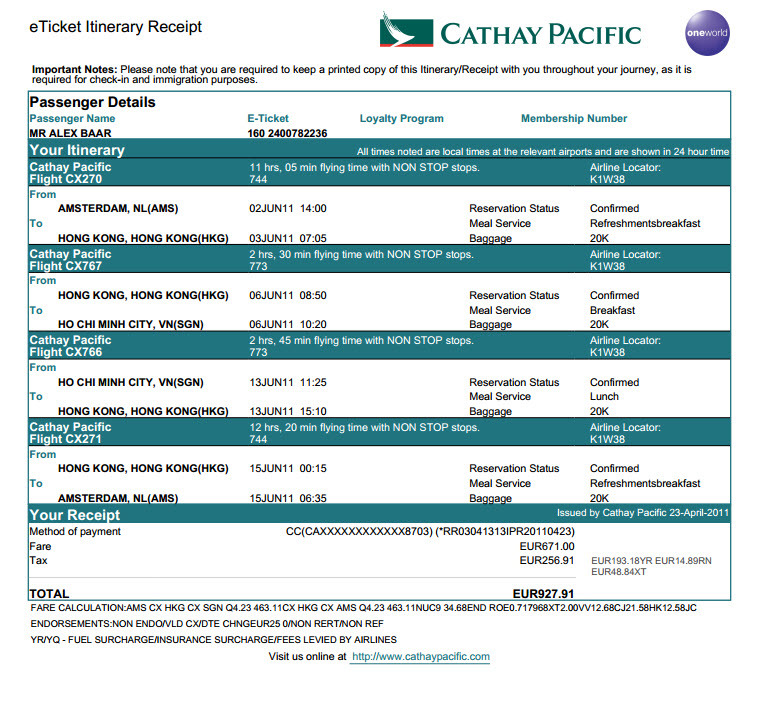 This is a booking confirmation from Cathay Pacific. One that I received after flying to Hong Kong last summer. 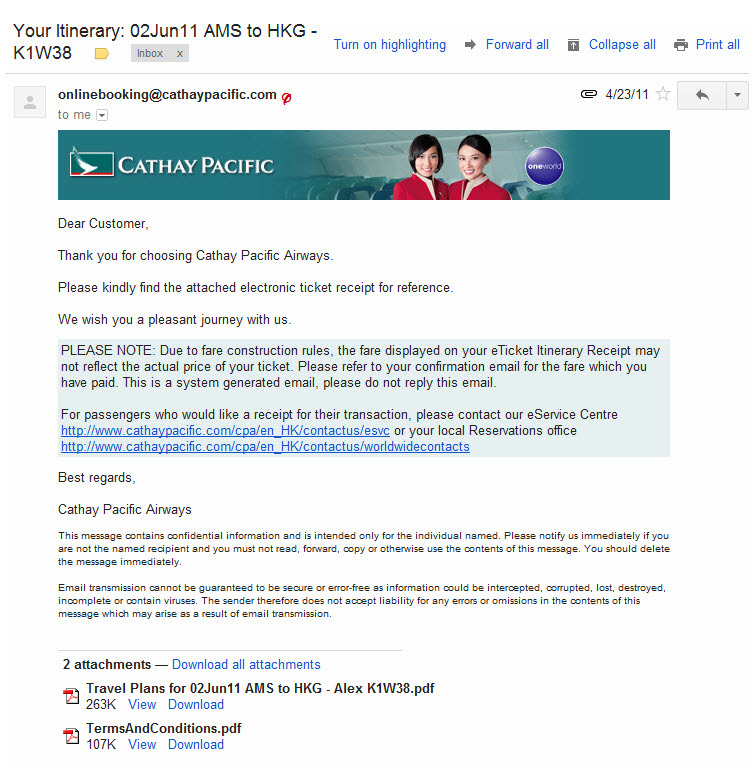 I still do not understand why airlines make this booking confirmation not more fun. Add value to it, create new contact moments. Do something more then just the flight details. It is so boring. So many chances. Most airlines have boring booking confirmations by the way. The e-mail itself is probably one of the best read and opened e-mails ever. Ask people if it is a leisure or business flight and use targeted relevant content to get contact moments. Of course the booking process at the website must be as easy as possible, but after the booking is finished so many chances! Social sharing buttons are missing. 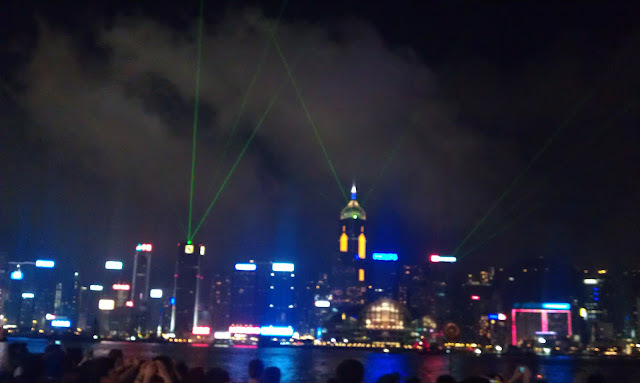 I would have loved to tell everybody I was traveling to HK. 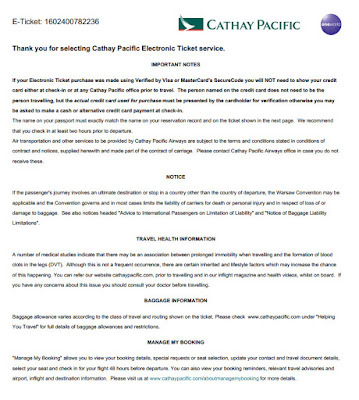 Try to get more information from the traveller to update the profile for more relevant communications via this e-mail. Try to sell additional articles or services, not only hotels, or car's but also MTR tickets for example. Let people download specific generated guide books or i-magazines for destinations that can be read at Ipad or cell phones. But do it personalised. Ask people's preferences. This add's value. If I am for leisure in Hong Kong and for the first time, I might want to visit the symfony of light, but if I already travelled there 5 times, I am in need for different information. Stay in contact with the people after the booking untill (and after) the flight. 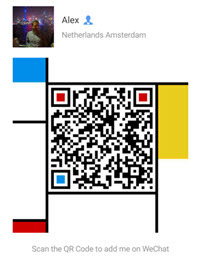 After the booking but before departure, inform people about the destination and collect information. After return, let people write reviews and use user generated content to improve the quality of the website and social sites. Good for SEO, good for returning and new visitors. 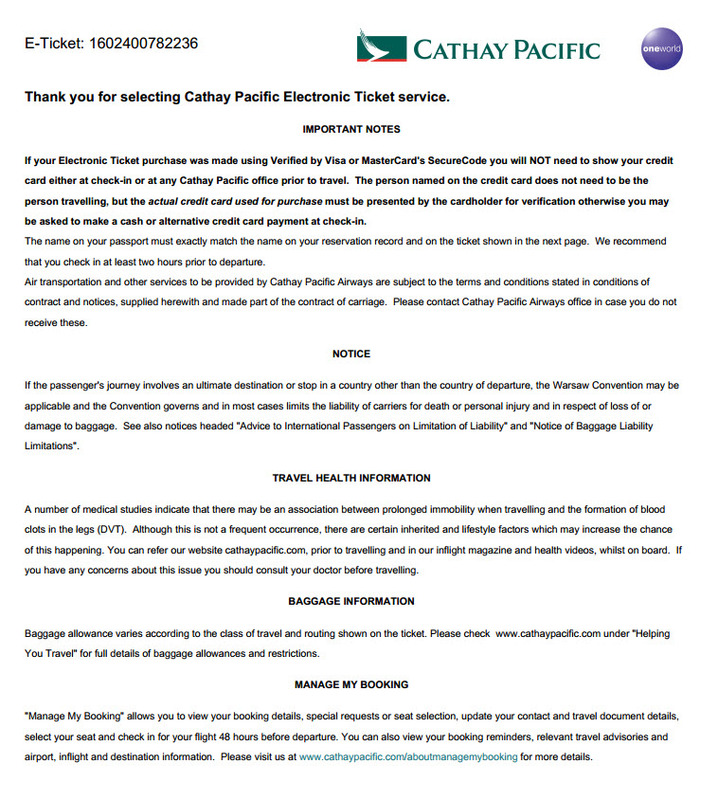 Inform people about the great cathay pacific service of checking in "in town" for example. If I did not read about it somewhere else, I wouldn't have known. These small things give extra service that CX can offer. Tell people. Publish your facebook or twitter account at this booking confirmation. Publish QR codes/links to information about the airports that are visited, but combine this with vouchers or promotions from local vendors at the airports. Think social and multi channel with every contact moment. Just a few idea's there are so much more improvements that can be made. It has been since June now, I have not received any communication after my flight from CX. That's strange, if they had asked me more information, they would have known more about my preferences and I might have booked my last flight to Asia with CX instead of Finnair, as I did now. 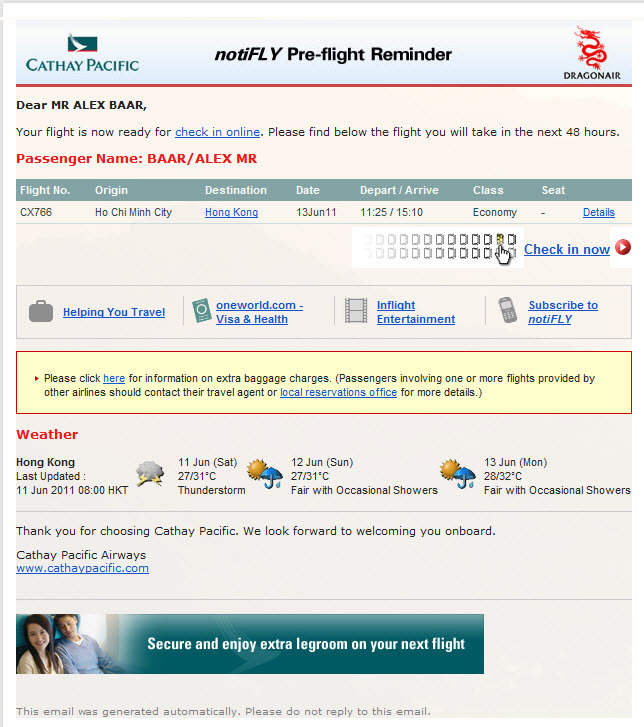 This (below) is the pre-flight reminder, or check in e-mail. This is already much better, including the actual weather forecast. But also in this case, if you want to offer "service", give information about the best seats (many websites that have this information), some real time news about the destination etc. But as I see in this video, improvements are on their way. Hope they speed up, since flying with CX was a good experience but I see many other airlines being much more active and much more social then Cathay Pacific. Dennis Owen, from Cathay Pacific explains. 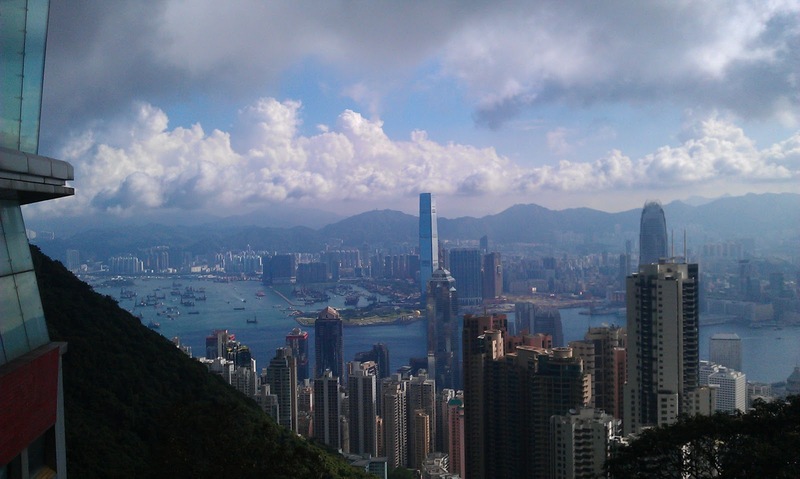 Hong Kong, view from "the peak"
Alex Baar | Digital Marketing |. Simple theme. Powered by Blogger.